Good things come to those who wait, the saying goes, but Amokachi obviously wasn’t a fan of that saying. Daniel Amokachi spent only two seasons at Everton and was hardly prolific in either of them, but when it comes to achieving cult hero status, sometimes all it takes is one game. Because when Paul Rideout went down injured with 20 minutes to go in Leeds, the Nigerian took matters into his own hands. He’d scored only once in 12 Premier League games up to that point, but on a wild afternoon at Elland Road he wrote himself into Everton folklore. Picture this, a player while benched instructing the referee to give him a substitution without the coach’s authorization and like magic in his boots, goes ahead to score two of the winning goals for the team.Wild innit?! Everton were leading Tottenham 2-1 in the semi-final, when Amokachi decided to substitute himself on, much to the indignation of his coach. Despite the gamble, the striker scored twice within ten minutes and his risky move was a roaring success. 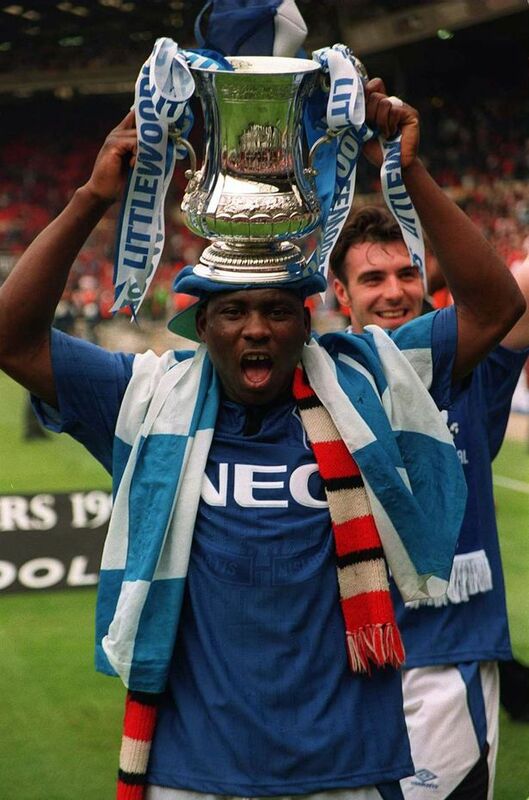 #OnThisDay in 1995: Daniel Amokachi (@FrenzziiiBull) scored twice as #EFC beat Spurs 4-1 in the FA Cup semi-final. The Nigerian famously subbed himself on against the manager’s wishes, whilst Paul Rideout was injured. Tottenham were then wiped out from that point onwards, with Everton going on to claim a 4-1 win over Spurs. To top it all off, The ‘Toffees’ then met Manchester United in the final, and clinched the FA Cup title with a 1-0 victory at Wembley Stadium. If this isn’t a lesson on courage and determination, i don’t know what is. It is however good that it worked out well for Amokachi who didn’t get to know what his coach was capable of if he hadn’t redeemed his insubordination. “The best substitution I never made,” was how Royle described Amokachi’s glorious cameo. Marsabit Residents lauded for serving dirty water to leaders.